●Flexible angle knobs allow convenient carry lighting, excellent element for night work! ●Easy to rechargeable, Integrated 18650 durable rechargeable battery, use it at ease anytime and anywhere. ●USB port for charging, no longer worry about the short battery electric quantity. ●Long Light Span and Assured Quality Guarantee. Any quality question,pls contact "jtzmusalighting@hotmail.com", we will get back to you within 24 hours. Attention:●Although the item is IP65, do not immerse in water for a long time. ●Please don't use in flammable, explosive or corrosive circumstances. ●If the glass is broken, replace it immediately. 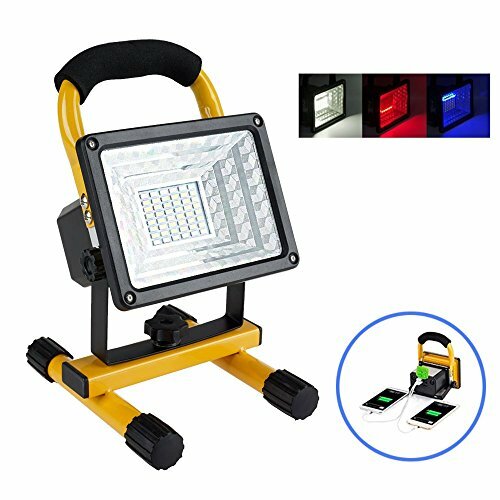 Multi-Purpose floodlight -- Easy to carry or put onto the ground with the stand or hanging for job site work lighting/camping/recreational fishing/cave exploration/photography fill light/night driving/car maintenance/emergency situation/wild exploration life/power cut backup, even for a cool party! If you have any questions about this product by Lanfu, contact us by completing and submitting the form below. If you are looking for a specif part number, please include it with your message.